I have decided that today I will share something different with you . Because I got bored writing reviews about traditional softwares , that’s why I have chosen a full of software . I do hope you will like this different gift too . Although I have many useful offers to share with you . Today I have another great gift from one of my favorite Ashampoo to share with you . 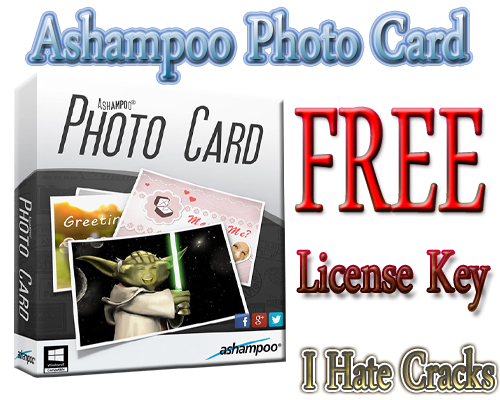 You can get Ashampoo Photo Card full version original value $12.95 per license key for free . Ashampoo Photo Card is especially designed for novice or inexperienced computer/laptop users . Ashampoo Photo Card is the intuitive , easy to use and straightforward solution to turn your desired images into stunning and eye catching greeting cards . It comes with lots of facilities and tool to shine up your greeting cards , with the help of its easy to use interface you can add text , border , frames , icons and many cool effects . You will find it full of fun after getting it . Nowadays almost every internet user has a webcam , it has become as important as important the internet connection is . I have noticed that many of users that has a webcam makes it full of fun by adding cool frames , borders etc with the help of some kinds of software but unfortunately almost these kinds of software are paid . If you want this kind of software but can’t afford , you have a webcam then good news for you is that It also has webcam support . Ashampoo Photo Card has a huge list of attractive and awesome built in themes and the good thing these cool and awesome themes can be used suitable for every occasion such as birthday , wedding etc . Ashampoo Photo Card (in trial version) has 62 themes but you get more if you buy it . It also has a simple image editing feature but fully equipped with all needed tools . If you your desired thing needs a little bit change or optimization then you can adjust transparency, size, brightness, contrast and saturation , mirror and flip images and as well as you can add and style texts and clipart objects . Ashampoo Photo Card has many easy to use sharing options , By using these options , You can easily share your greeting cards with your family members and friends , you can send in email and upload to Facebook , Picasa and Ashampoo Web etc. Unlike other softwares , Ashampoo Photo Card does not require extraordinary system resources , a normal speed processor and 256MB ram is a perfect match to use it well but 512 MB ram is recommended . But If you want to send greeting cards by email then you need a MAPI-compatible e-mail client like MS Outlook, Windows Mail or Mozilla Thunderbird , Microsoft Visual C++ 2010 x86 Redistributable and Microsoft Visual C++ 2012 x86 Redistributable . 150 Mb disk space is enough for installation process . Ashampoo Photo Card is available priced at $12.95 par license key but you can grab a license key to activate the full version for free . Download Ashampoo Photo Card from here . Install it , though its interface will be in German language but don’t worry we can change it . After installation , click ” Konfiguration ” and select ” Sprache ” and now select English and hit okay , you are done . Now visit the Giveaway page and submit your Ashampoo’s account email address . You will get a license key on next page , you also receive a license key in mailbox .